"STOP" Vaso rigato lungo nero. Un vaso quadrato robusto e innovativo, con ampi fori di drenaggio e rigature verticali che impediscono alle radici di girare attorno alle pareti costringendole a diffondersi uniformemente in tutto il volume del substrato di coltivazione. Dimensioni: Imboccatura 9x9cm, altezza 13cm. 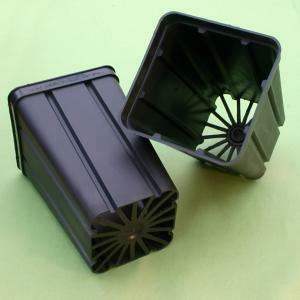 A robust special square pot with enhanced drainage and root aeration, expecially suitable for plant that don't need frequent repotting, very recommend for Lophophora, Ariocarpus and other cacti with deep taproots. This pot has special internal ribs that protect your plants from rolling up of the roots around the pots wall, this allow roots to stretch out without interlacing. So plant can stay healthy in the pot for very long period. Should last many years, with care. These are brand new Square pots out of the manufacturer's box. They are made of durable rigid thermoformed black polyethylene (rot/heat and frost-proof) CAN BE USED FOR INDOORS OR OUTDOORS. They measure 9x9 across the top, and 13 cm in height. These pots are perfect for planting Lophophora, Ariocarpus and other cacti or succulents with deep taproots.